Start boiling the water to cook the macaroni. Shred the cheese next, or have pre-shredded cheese. Utensils needed: 2-quart casserole dish, saucepan, pot for cooking macaroni, measuring cups, spoons, etc. 1/2 cup butter (1/4 at the beginning and 1/4 needed for the end of the recipe) The original recipe called for “Blue Bonnet 60% Vegetable Oil Spread”. 2 cups [or more] shredded cheddar cheese (8 oz). Use sharp or medium. 20 RITZ crackers, crushed (about 1 cup). Or the Trader Joe’s Golden Round crackers. In saucepan, over medium-high heat, melt 1/4 cup butter. Gradually add milk, stirring constantly until mixture thickens and begins to boil. Stir in cheese until mixture thickens and begins to boil. 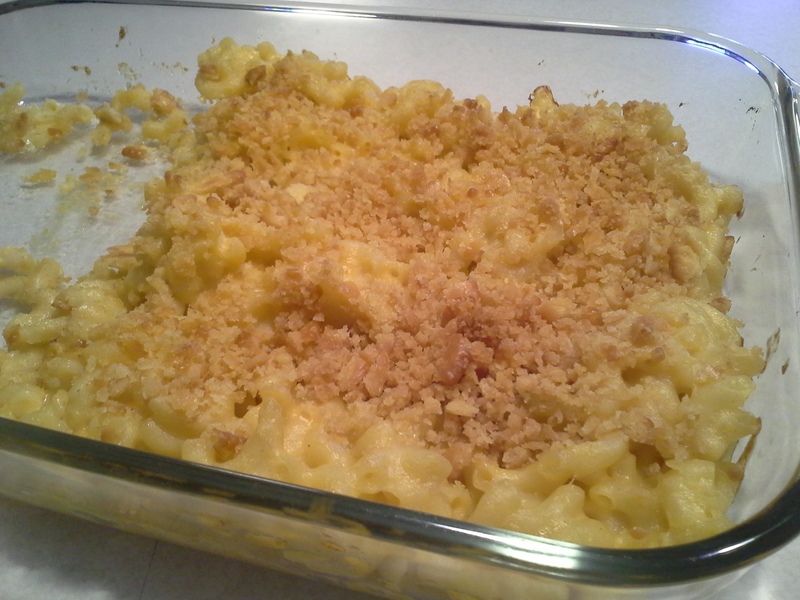 Combine cheese sauce and macaroni in 2-quart casserole. I forgot to take a picture until I’d already served some, so sorry for the not-so-pretty picture!